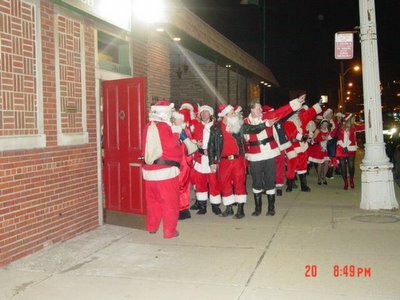 As I wrote about a week or so ago, Detroit Santarchy is tonight! My sister plans on being there (and hopefully will send pictures). 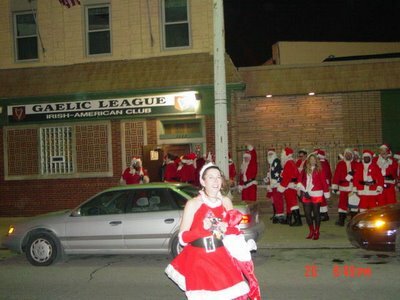 So, if you happen to be in the area of downtown Detroit tonight at bars such as the Lager House, LJ's Lounge, the Irish Gaelic League, or the other bars listed here, you very well may have a horde of thirsty Santas (many of them--shall we say?--unconventional) descend upon your bar looking for a good time. Wish them all a Merry Christmas. 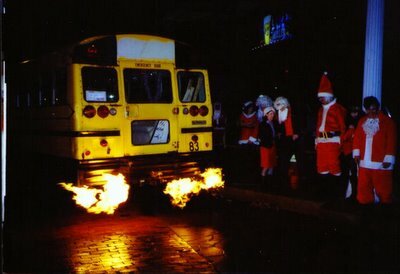 What's with the flaming tailpipe on the bus? 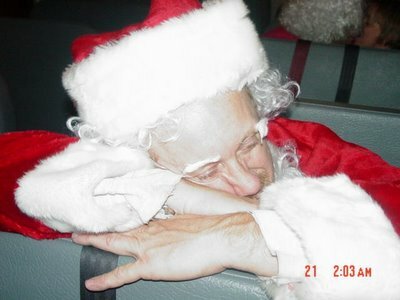 Too much ethanol? Regarding the flaming tailpipe - it's an old hotrodder's trick. As I understand it, they have some way of dumping fuel into the engine so that it runs overrich, then they ignite the exhaust at the tailpipe with a spark plug installed for just that purpose. I think that's the gist of it. Maybe a hot rodder can explain further.